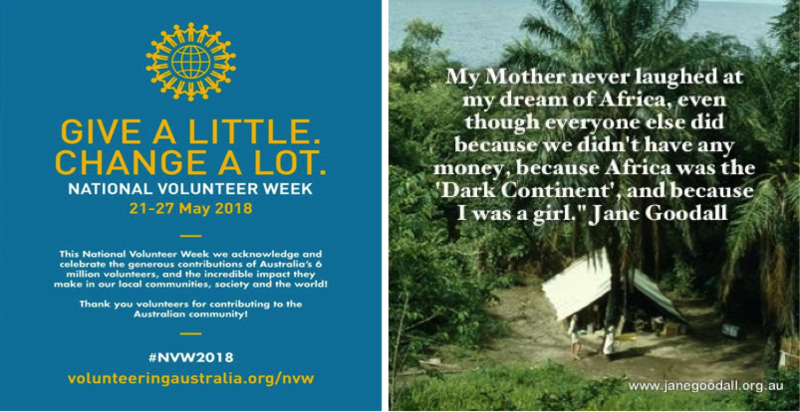 This month we celebrated National Volunteers Week. The Jane Goodall Institute Australia is incredibly fortunate to have more than 50 volunteers all across Australia. These passionate and dedicated individuals are a powerhouse of support, without whom we simply could not survive. We also want to say a special thank you to all of the wonderful mothers in the JGIA family, who celebrated on Mother’s Day this month. Mothers give us the gift of life and Dr Jane talks about her own mother’s inspiring influence on her life and work as well as that of the amazing chimpanzee mothers of Gombe. And in case you want to see more of Jane’s personal journey as a mother, have a look at this gorgeous clip from the National Geographic documentary JANE. Dr Jane Goodall inspired Australia!